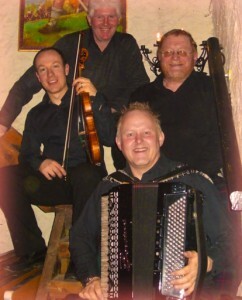 Kinlochard Ceilidh Band has established itself as one of the most popular ceilidh bands for hire for weddings, parties dances and corporate hospitality. The Kinlochard Scottish Ceilidh Band has undertaken many overseas tours in North America, Australia, Europe, India, the Far East and Africa including a six-week tour of Singapore and New Zealand, and, at the latter, represented the U.K. at the Auckland International Folk Festival. In 2000, the band played at Disneyworld, Orlando, Florida as part of the Millennium celebrations, as well as in Chicago, Kansas City and St Louis. More recently the band has done work in Brussels for the Scottish Executive and the European Union. The band’s reputation as a leading exponent of a more contemporary, up-tempo style of Scottish Country Dance music has become well-established on the international scene. As a dance band, they specialise in Scottish Country Dancing and Ceilidh music. Their repertoire also includes foxtrots, quicksteps, modern waltzes and Latin American rhythms. The band can call all the set dances, as required, so nobody need feel left out. At corporate hospitality functions – many of which are for overseas guests – dances can also be called in French or German.